We’ve been carefully watching the Supreme Court confirmation hearings for Judge Brett Kavanaugh, who was nominated by President Trump to take the seat of retiring Justice Anthony Kennedy. 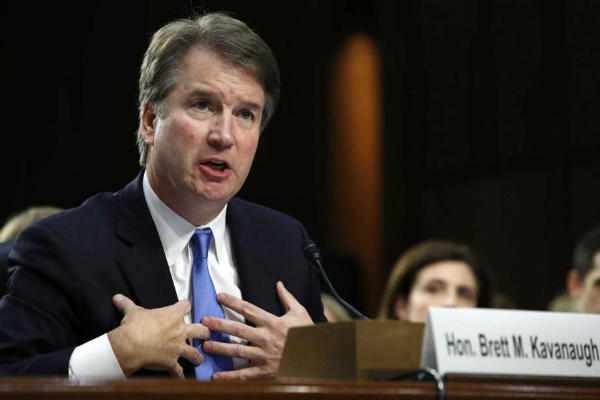 This week on State of Belief, Interfaith Alliance’s radio show and podcast, we’ll dig into what happened in those hearings – and we’ll take a trip from the Beltway to Broadway. We’ll also reflect on the legacy of the late Senator John McCain and what his loss means for the state of our nation. Judge Kavanaugh’s record on religious freedom is both thin and concerning, so we’re glad that senators asked the Supreme Court nominee about his views regarding the separation of religion and government. Senator Mazie Hirono even asked one of the exact questions Interfaith Alliance has been asking in the “We Have Questions” campaign since Kavanaugh was first nominated! The questions, however, were asked as a part of a confirmation process that is anything but politics as usual. This week we’ll hear State of Belief host Rev. Welton Gaddy speak with attorney, activist and author Rabbi Dr. Jay Michaelson about what happened in the hearing room, what Kavanaugh had to say about religious freedom and how the process seems to have broken down. Jay once clerked for Judge Merrick Garland. Two years ago, the cast of the hit musical Hamilton directly addressed audience member and vice president-elect Mike Pence during their curtain call. Just this week, a cast member of the Broadway production of Frozen pulled a Trump flag out of the hands of an audience member who had unfurled the banner at the end of the show. How has the upheaval of our national culture impacted Broadway and the performing arts community? Can art serve to influence our political culture in a productive, meaningful way? This week, Welton will speak with writer and theatre historian Robert Viagas about how things have changed – and how they haven’t. As fast as things are moving these days, it already seems a long time ago that the nation laid to rest Senator John McCain. But both the legacy and the symbolism of a long and patriotic career shouldn’t disappear in the noise of the moment. Eulogized by two former presidents (and campaign opponents) and mourned by supporters and rivals alike, McCain’s death and funeral captivated the nation. Welton will sit down with Rabbi Jack Moline, president of Interfaith Alliance, to discuss what we all can learn from the legacy of a man who was a notorious curmudgeon and yet, ironically, became a symbol for bipartisanship and civility.